Homespun Stitchworks..... For the love of vintage: Embroidering and positioning of monograms. Historically, women embroidered their household linens beginning in their childhood as they built their trousseau. Traditionally it was with the brides maiden initial, as of course she had no way of knowing what her married initial would be. When embroidering sheets it was custom to embroider at the top, so that when the sheet was folded over you could see the beautiful design, and pillow cases along the open side of the hem. Printed books first appeared in England in about 1477, so prior to this time girls would work from the letters they had been taught and the stitches they knew passed from grandmother to mother to daughter. 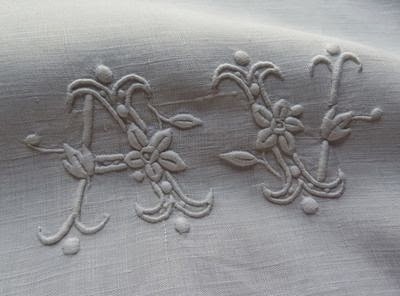 Later on especially on French linen's, I have seen some stunning examples of monograms with flowers and leaves and hearts stitched with initials. 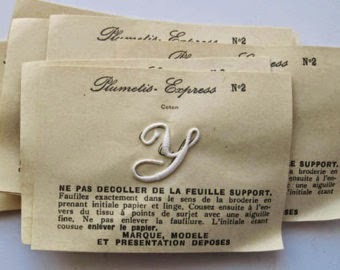 You could buy a stamp with ink as a stencil or you were able to buy raised initials in plain cotton to position on your work and then stitch in white thread over the top with satin stitch. Because of the popularity of the all things vintage, monograms have become sort after to incorporate into peoples sewing. People add them to cushion covers for the bed for instance. They in fact have become very expensive now. Because I use vintage French linen sheets in my work to cut up and use as the canvas of my pictures, I do try and buy them with initials of my own or my family - that way I can use the sheet for my work and have a little bonus for my personal use. 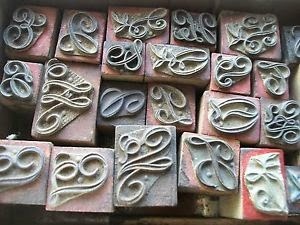 You can find original stamps on Etsy or Ebay or indeed original patterns as well. Also you can still find the raised cotton ones to stitch over yourself. Of course you could design your own and just simply stitch over your light drawing of it with white embroidery thread with any stitch you like. Some early examples are in cross stitch and that really is a very easy stitch to master. Have a go yourself, it really is worth the effort. 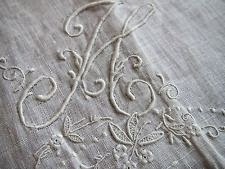 You could embroider some pillow cases as a gift for an engagement present or as part of a picture for a wedding sampler. I hope you have a wonderful day and Happy Stitching! Isn't that stunning work... from a vintage sheet. Example of the raised cotton monograms to stitch over. 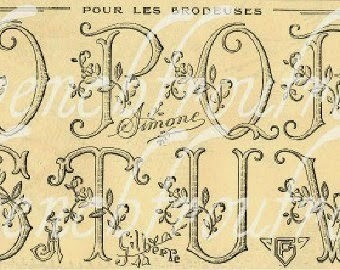 Monogram 'H' which is my surname initial..... now that is breath taking is it not. Have a wonderful day and I hope you give it a go yourself or decorate with some antique ones.